The members of the Versailles FFA outdoor power team who placed fifth in the district contest included (l-r) Sam Gilmore, Austin Timmerman and Isaac Gilmore. 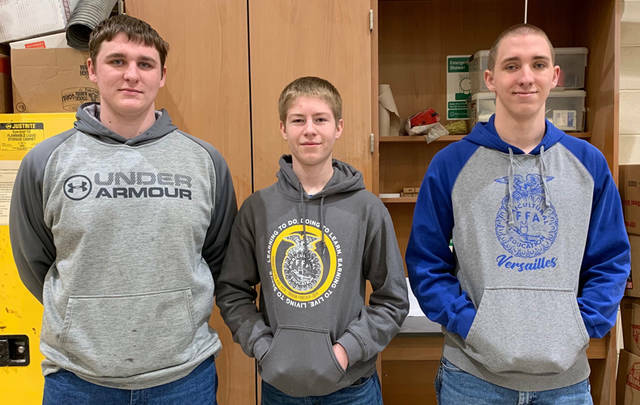 VERSAILLES – The Versailles FFA ag mechanics team competed on March 25 in the District 5 FFA Ag Mechanics Contest at Upper Valley where they placed fifth in the district out of 12 teams. Contestants participated in fluid ID, measuring with calipers, wire ID, welding and tool identification. The team consisted of Austin Timmerman, Sam Gilmore and Isaac Gilmore and was led by Timmerman. Ben Gehret and Jason Langenkamp hosted practices and helped coach the team.